Linn Acres Farm: Homemade Applesauce Recipe - No Added Sugar! 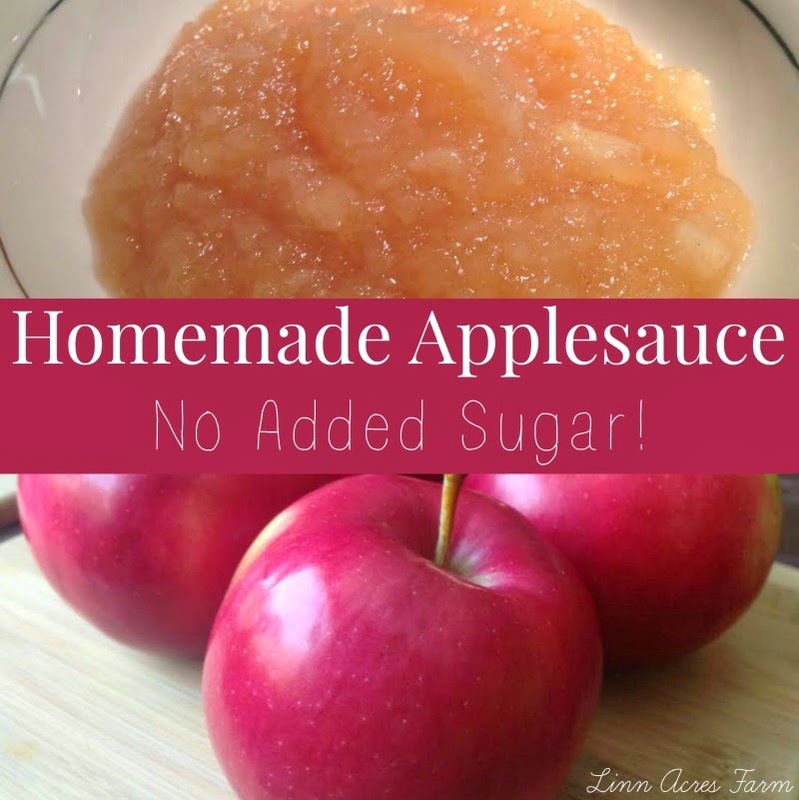 Homemade Applesauce Recipe - No Added Sugar! We absolutely love apples and usually have a bushel or two around! One of the easiest ways to use up your apples, is by making delicious homemade applesauce. Only five ingredients are needed for this yummy applesauce, and no added sugar! If you have a sweet tooth, you could always add a little to suit your tastes. But I think many of you will be surprised how sweet your applesauce will be just on it's own! First, peel & slice your apples. We like to us an apple peeler, corer, & slicer, which makes this go incredibly quickly. If you have chickens, save the peels for them! Place all of your apples into a pot on your stove, pour in the water, add the cinnamon sticks (poke them down to the bottom for the best flavor! ), sprinkle in the salt, and squirt in the lemon juice. Bring the water to a boil, then reduce the heat, cover, and let it cook for about a half hour, then stir. Cook for another half hour, and your apples should be getting soft. Grab a potato masher, and mash the apples down. Let them cook for another half hour, remove the cinnamon sticks, and mash for one final time. You can mash them as much or as little as your prefer, depending on the consistency you like. If you really enjoy a cinnamon flavor, you can add a bit more powdered cinnamon to taste. If you have a serious sweet tooth and need to add some sugar, start out with just adding a 1/4 cup of brown or white sugar. Store the extra applesauce in a covered bowl in the fridge. Shared on the Homestead Blog Hop and the Sunday Social! Hi! I found you through the 104 Homestead on Facebook. One question for you: how long will this applesauce remain edible kept in the refrigerator? We can be slow about finishing applesauce at my house. Thanks, can't wait to try this recipe! Thanks, I'll try freezing it, too.